Loick Peyron and his crew on the 40m maxi trimaran Banque Populaire V have entered the history books setting a new record for the Jules Verne Trophy, non-stop around the world of 45 days 13 hours 42 minutes 53 seconds. They broke the record set in March 2010 by Franck Cammas' Groupama 3 crew by 2 days 18 hours 1 minute and 59 seconds. 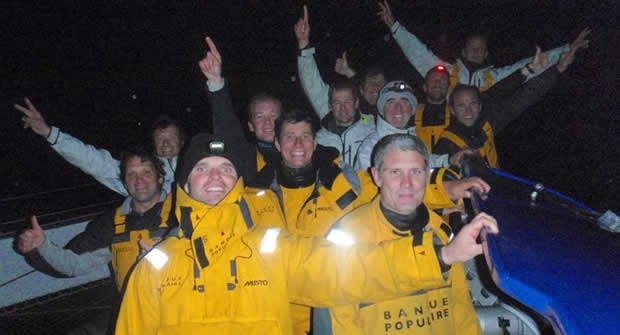 Having set off on 22 November at 08:31:42 GMT,on the line between Ushant and the Lizard, Banque Populaire V completed her lap of the planet at 22:14:35 UTC. Her average speed was 26.51 knots, having sailed a total distance of 29,002 miles. Sailing on board with Loïck Peyron were Thierry Chabagny, Florent Chastel, Thierry Duprey du Vorsent, Kevin Escoffier, Emmanuel Le Borgne, Frédéric Le Peutrec, Jean-Baptiste Le Vaillant, Ronan Lucas, Pierre-Yves Moreau, Yvan Ravussin, Xavier Revil, Brian Thompson, Juan Vila while routing them from his base in Majorca was Marcel van Triest. After crossing the line, Loïck Peyron commented: "The feeling of everyone on board? Emotion and joy! We've fulfilled our contract. At present we are savouring our victory before we return to Brest tomorrow morning to share this beautiful story with everyone. Our memories are full of beautiful images: the beginning, the icebergs, albatrosses, Kerguelen Islands ... When you sail around the world for 45 days, you see many things. The only one we have not seen was Cape Horn, but this frustration was erased by this record we have now. We are very proud!"